Here is another unique scaffolding job. It just goes to show you that when you think you’ve seen it all – think again. Here is a chapel inside of a hospital, and not just any hospital, mind you. This is in the heart of Our Lady of Lourdes Medical Center, Camden, New Jersey. saving Our Lady of Lourdes? Well, this is the same place. Except this time, it wasn’t quite a pressing emergency as after the earthquake. But the earthquake certainly might have exacerbated the damage. (Brandywine Historic Services) could get to the crumbling plaster on the ceiling. The challenge here was that the church had to remain open for daily services. under the jacks to protect the vintage marble floor. 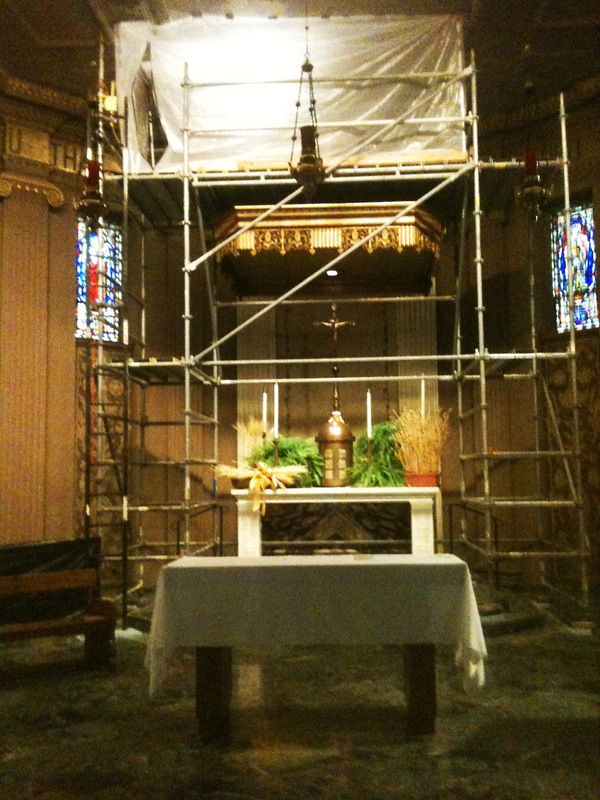 enlarge the scaffold to reach the affected areas. 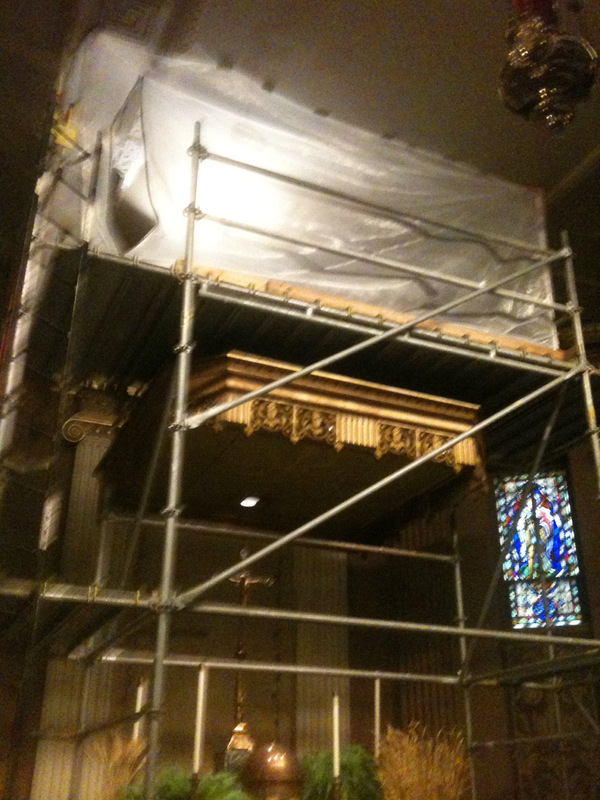 The chapel gets to remain open (business as usual) and the repair crews get access to the ceiling. It’s a win win for everyone involved. The Chapel is always open for patients, visitors and associates. 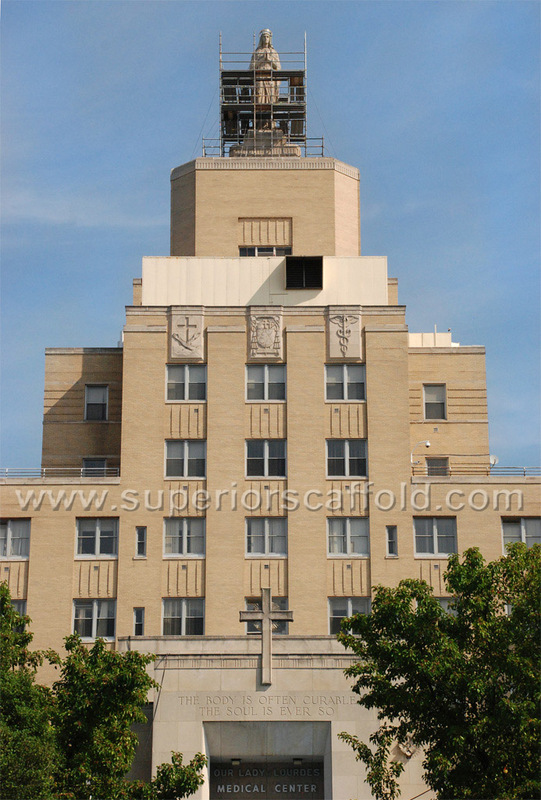 Visible upon entrance to the main lobby, the hospital Chapel is at the very heart of the Medical Center. It is a place of scripture, worship and prayer from which comfort, grace and blessing flow into the halls and rooms of Lourdes. Mass is held daily at Noon. Special schedules for holidays are posted outside the chapel. This entry was posted on Thursday, September 27th, 2012 at 2:26 pm	and is filed under News & Updates, System. You can follow any responses to this entry through the RSS 2.0 feed. Both comments and pings are currently closed.